From the opening title, it’s quite obvious that State of Anarchy: Master of Mayhem is not a game to be taken too seriously. It’s as if someone took the early Grand Theft Auto titles (complete with overhead viewpoint) and mixed them with the bullet hell shooter genre. Sprinkle in some light humor and a dash of hand-drawn doodles and you get yourself the final chaotic product. It certainly looks distinctive enough, but is it worthy of a spot on your Switch’s Home Screen? You play as an unnamed sociopath armed with a handgun. Your initial goal seems to be to make as much money as possible, while causing as much destruction as you can muster. You accomplish this by shooting everything that moves, but it’s not as easy as it sounds since everyone you encounter also has weapons and is out to get you. You’ll need to avoid their slow moving bullets, evading or destroying the rioters and putting them in the ground before they stop you from getting to your destination, which is highlighted by a target arrow. Being on foot is quite dangerous, but you can hop into a vehicle for faster travel with the added benefit that bullets won’t harm you. As you might expect, each level is capped off with a boss that must be obliterated to move on to the next stage. In between levels you’ll get a tally of all of the money you’ve earned (stolen) while on your murder spree. You’ll also pick up a new weapon, which is automatically replaced with another before the next level begins. These can range from dual automatic pistols (hello Lara Croft) to shotguns, and even alien weapons! Wait, aliens? Yeah, they’re thrown into the chaos as well! The early missions are straightforward and require typical things like driving to the bank to get some cash and killing the boss. After a few levels UFOs invade and a large chunk of the game takes place on another planet or in outer space. The stages often have different objectives and there are plenty of obstacles in your way. It’s not uncommon to have several mid-level bosses or force fields that need to be destroyed to complete a mission. Then there are the chase scenes where you have to stop a moving target from getting away. In general the various courses don’t take too much time to beat – usually three or four minutes. There are 45 of them and if you die you simply start over on that level with no real penalty to your progress. The upgrade systems are nice, especially for a game with almost no special features. You use your cash to gain attributes such as firing rate, bullet range, and critical hit rate. Your level increases with each kill you make. When you gain a new level, you get talent points, which can be exchanged for skills such as speed, increased hit points, and stronger defense. There’s not a lot of variety to the stages, and there’s not much you can do other than kill, collect money, and complete your task. If you’re looking for side quests and secrets like Retro City Rampage or Grand Theft Auto, this is not your game. The backgrounds are plain and lack many features, and you can’t enter a building unless it is your target objective for the level. The characters, bosses, and vehicles lack character. Of course, this is the intention of the hand-drawn graphic style and stick figures. I enjoyed it for what it was, and wasn’t expecting to be wowed by eye-candy. The sound effects are described as “mouth-made” and they do sound like small children playing cops and robbers. They make a fine companion to the artwork. The music in the game, however, is marvelous. Most of the tracks are high-energy rocking guitar instrumentals. This came as a shock to me, as I expected the music to also be simplified or nonexistent. The game controls as you might expect: you use the left stick to move, the right stick to fire, and the L button for your secondary weapon. Driving and shooting at the same time does take a while to adjust to. Overall, State of Anarchy: Master of Mayhem is fun in short bursts. It’s one of those great filler titles that are fun to play to take a break from the larger games on the Switch. Perhaps the biggest miss here is the lack of a 2-player co-op mode, like Smash T.V. or Jackal. These types of games are always more fun with a friend. The game offers a healthy, yet not impossible challenge. It does a lot of stuff right, and I really enjoyed the soundtrack, but there’s just not a lot of depth here and virtually no need to explore. Still, if you’re just looking to blow some stuff up, this one will fit the bill nicely. State of Anarchy is worth considering if you’re looking for a smaller game to play in short bursts. It’s a fun time killer, but there’s not a lot of depth here. That’s not necessarily a bad thing – sometimes you just want to zone out and shoot everything that moves. 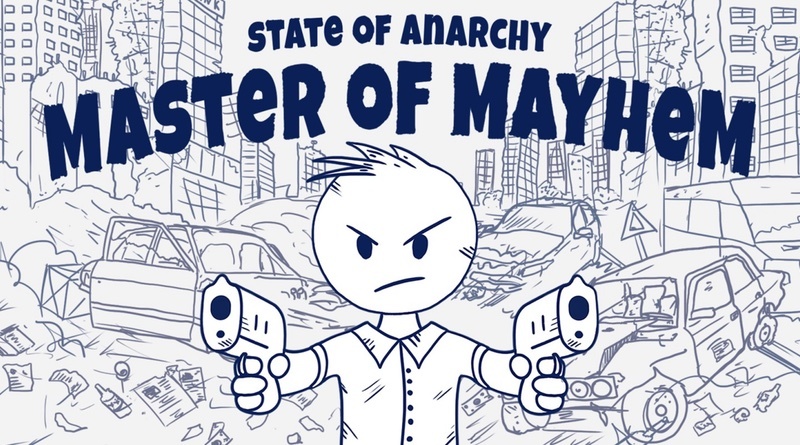 State of Anarchy: Master of Mayhem was reviewed using a final retail Nintendo Switch download code provided by the publisher.